A 45% Savings off MSRP. By doubling the thickness and added inner layer, the canopy is stronger, more durable and built to last. It will sustain stronger rain & snow storms and wind. To provide more protection when using; phones, tablets, cameras and other devices or products we have designed a visor that easily attaches via built in Velcro to the front adding an additional 5” of coverage. When not needed it is simply removed. We have upgraded the functionality of the side buttons to a softer material for easier release. New rear light reflectors built into the back support for safer night protection. The umbrella has been our go-to for rain drop coverage for centuries. We thank you for your service. There’s a new kid in town. Meet Nubrella. 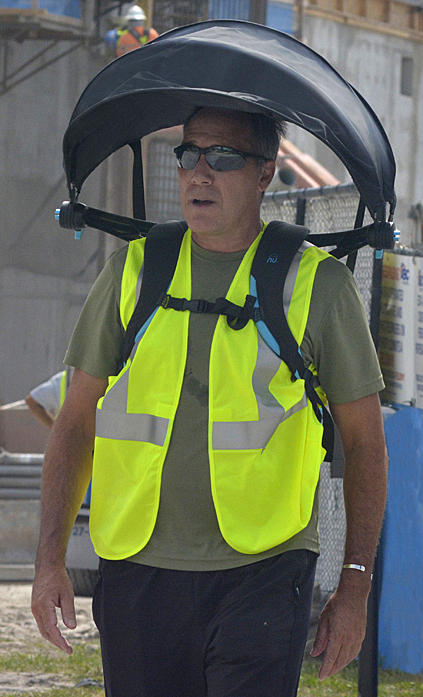 Worn back-pack style… it won’t invert and it’s hands-free…rain, wind, snow and sun. Rain or shine, dogs gotta walk. The "Original 1.0 version"of the Nubrella shown above. …this is your lucky day. 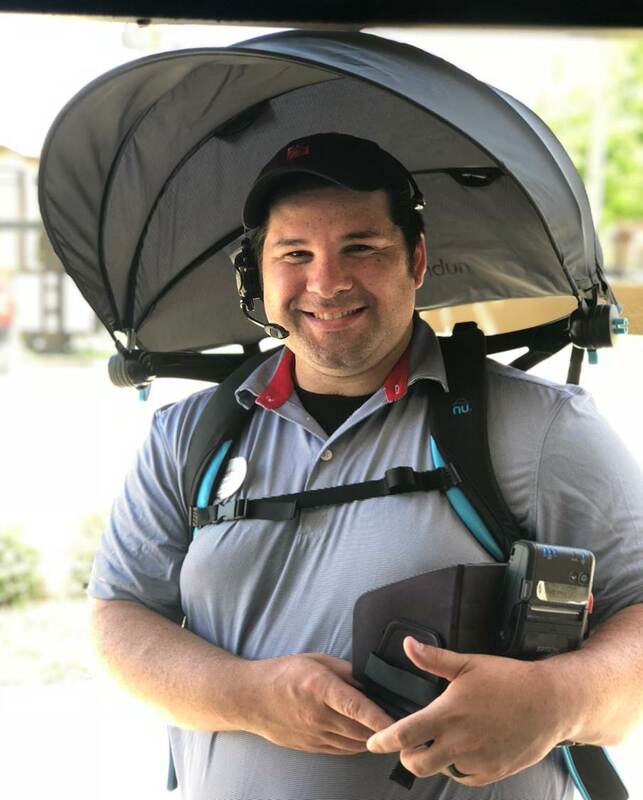 A hands-free umbrella is a natural fit in today’s technology-driven world where everyone is dependent upon smart phones and tablets; rain or shine. 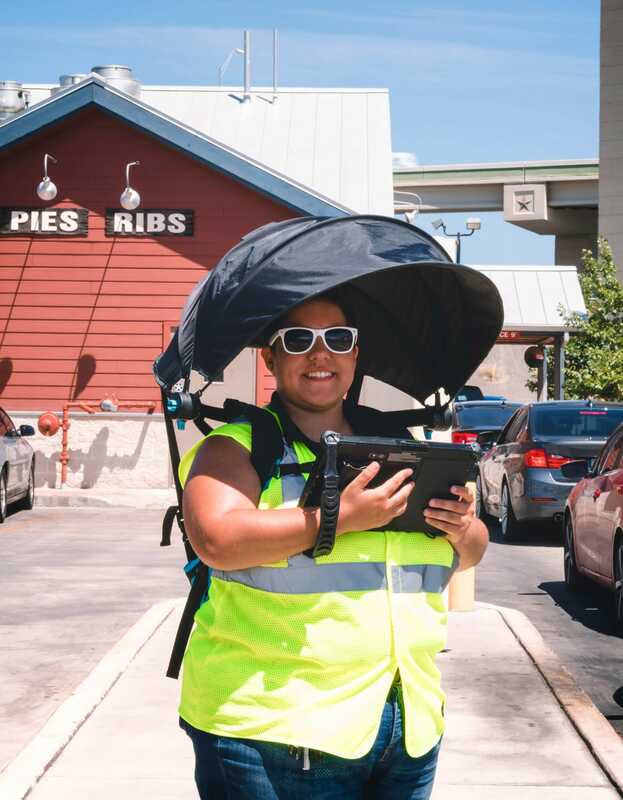 Protect your workers from the elements of nature from rain to extreme heat and damaging UV Rays. Bike riding is a breeze without the invert or wet-effect. We have identified over 125 usages/applications in the commercial and recreational fields. Here are just a few…. 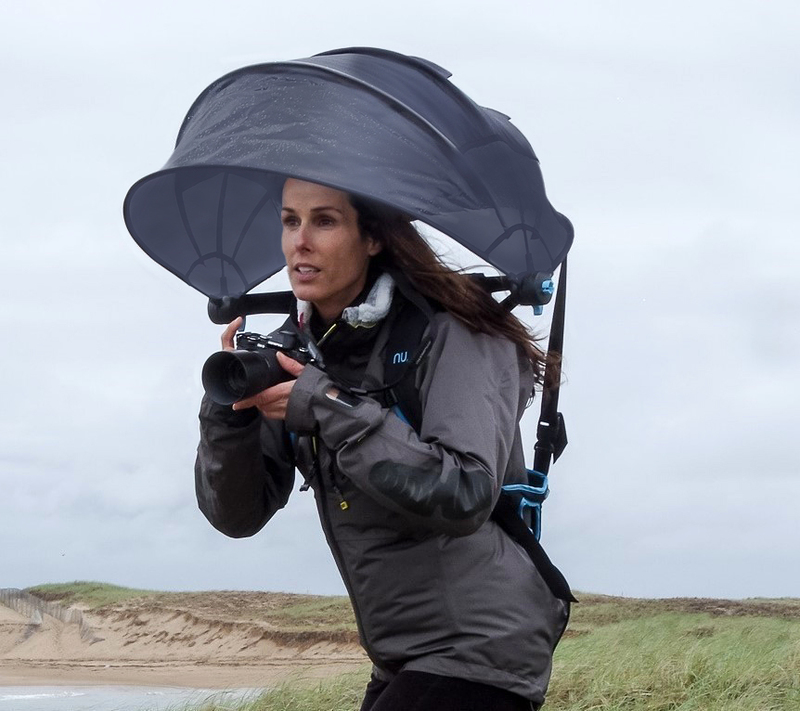 Weighing a mere 3 lbs., Nubrella is conveniently worn backpack style and functions like a hood. When not in use, it stores down your back. Simple. Intuitive. Eliminating the need to carry anything. For those that want to carry stuff? No problem. 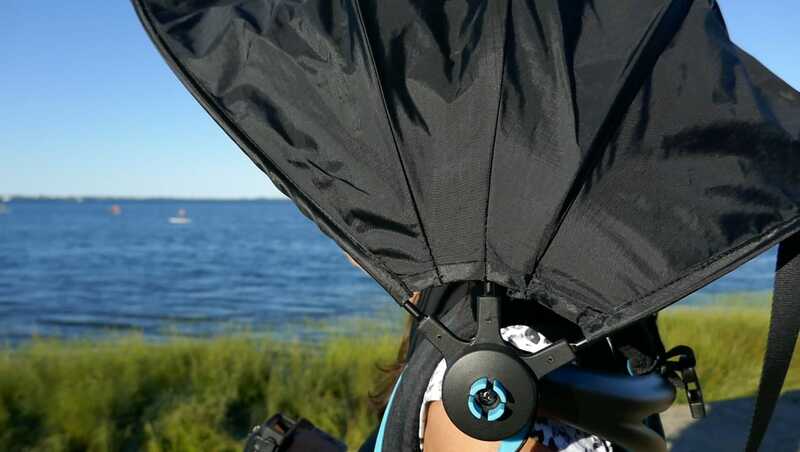 Nubrella sports a backpack that clips on for an ultra-secure connection. For the millions who work outdoors. Air vents that make this puppy invertible. A back support panel and additional straps holding canopy in place and for stability… and see those two clips on the back? 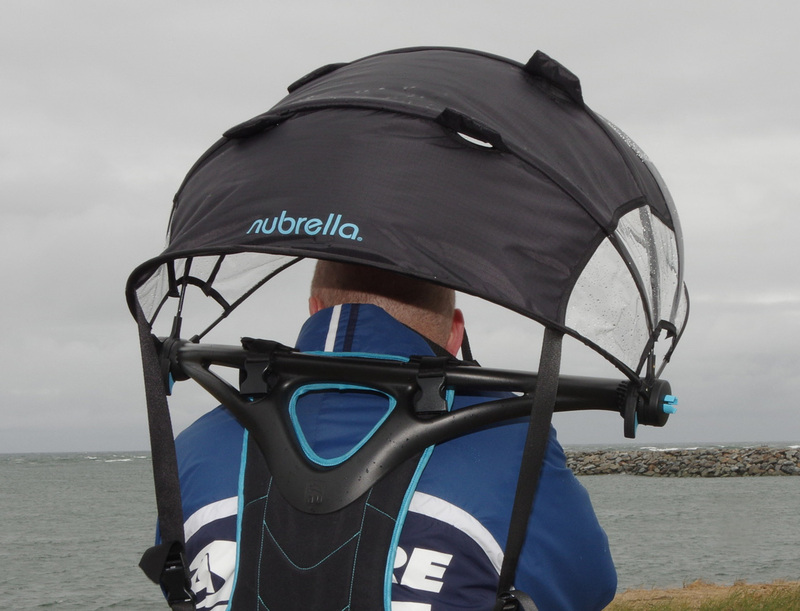 Those clip your Nubrella backpack! There’s another on the bottom for that extra secure fit for those real windy days. go away come again some other day. This song no longer applies. Don’t let the elements dampen your creativity. Enjoy extended coverage so you can focus on getting the shot.